Our History - What Have We Done For You? + Sign Up For The Alert List Now! 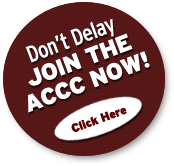 What Is The Function Of The ACCC? Sponsored a bill to create the "Historical Vehicle" license plate for vehicles 25 or more years old. Sponsored a bill to allow pre-1936 commercial vehicles to have passenger vehicle license plates. Changed to allow cars and parts of cars to be sold by hobbyists. Defeated a bill that would have required collector cars to meet modern safety glass, lamps, windshield wiper and brake laws. Defeated a bill that would have prevented the sale of any vehicle an insurance company deemed "beyond repair" to anyone other than a licensed dismantler or auto dealer, even if you owned it before the accident. Authorizes use of California auto, truck, and trailer license plates with the date corresponding to the model year of the vehicle. ACCC obtained executive order permitting the licensing of armored vehicles by private parties. Obtained exemption for some of these vehicles as historical vehicles. Drafted a bill to clarify the exemption of the regulation of car clubs. Changed California law regarding tax exempt status of non-profit clubs to match the federal law. Working to reduce the impact of sales tax laws on swappers. Successful in presenting data to the Air Resources Board that aided in elimination of exhaust retrofit devices on 1955-1965 vehicles. Exempted passenger vehicles 1965 or older from bi-annual emission inspection program except on change of ownership. Successful in defeating the requirement for an emission inspection yearly on all vehicles. Exempts most vehicles 1975 and older. This removed the requirement that made it illegal to operate an automobile not equipped with both front and rear bumpers regardless of whether or not the vehicle was that way when new.